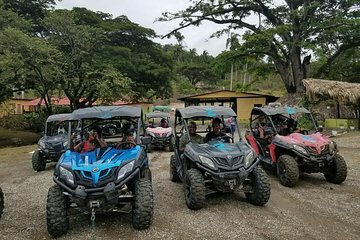 Conducción sobre un terreno accidentado y a través de la campiña dominicana durante esta brece excursión en un buggy todoterreno. Conduzca su propio vehículo o viaje en pareja por los variados caminos sinuosos y llenos de baches mientras disfruta del paisaje, la fauna y flora y mientras observa la vida local pasar. Siga a su guía a lo largo de la ruta y pare en el camino para hacer fotografías y disfrutar del paisaje. We loved our experience at Rancho Los Cacaos! The buggys were well maintained and went fast. The trail was long about 1.25 hours round trip and takes you across rivers, through the country side and through the village. It's bumpy and a little muddy and lots of fun! The workers at the ranch were very friendly from the moment we arrived. I highly recommend this tour! This was such a great excursion. It was only about 2 hrs away from our resort which was very nice. We were picked up at the resort by a private taxi, 10-15 min drive to the Ranch and we filled out some paperwork and just sat and waited for a few minutes for our ride. The owner of the property is very welcoming. We were 3 adults and 3 kids and they just allowed us to each drive our own machine with a child each. The machines ran perfectly. You don't have to get dirty on this ride. You do get a few splats of dirt but nothing too bad. The scenery is amazing... Bring your camera for sure. We were able to drive through fairly deep water which I find to be very cool! At the end of the ride we saw their crocodile, duck and turtles also we were able to sit on their bull extremely gentle bull. It was a great experience for the children. One of the best things about our vacation for sure. I would totally do it again and also next time I would ride their horses. Their horses all look to be in very good health.